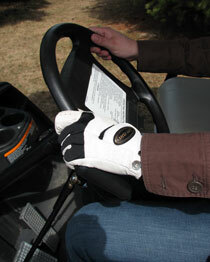 Sure Grip hand control users now have the option of adding the Push/Rock style of driving to their favorite recreation vehicles. Sure Grip has developed easy installation applications for many of the nation’s top selling side-by-sides, go carts and golf carts. Unlike other hand controls Sure Grip’s handle is in the vertical position, which gives precision control and the ability to drive with both hands on the wheel. With two hands on the wheel, drivers have the control needed when headed off the beaten path.